Fuentes's bold and timely study discusses the origins and nature of the tumultuous events that have recently transformed Mexican politics and society. The rebellion in Chiapas, a rash of assassinations, the break between Presidents Salinas and Zedillo, the continual struggle for democratic self-rule: These and other developments are addressed by one of Mexico's wisest, most influential commentators. 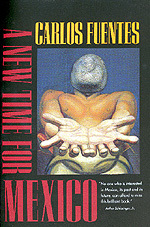 Carlos Fuentes, Mexico's leading novelist, is also an essayist and writer of screenplays as well as political commentary. Trained as a lawyer, he was Mexico's ambassador to France in the 1970s. Among his many novels are Terra Nostra, The Death of Artemio Cruz, The Old Gringo and Christopher Unborn. "No one who is interested in Mexico, its past and its future, can afford to miss this brilliant book. "—Arthur Schlesinger, Jr.